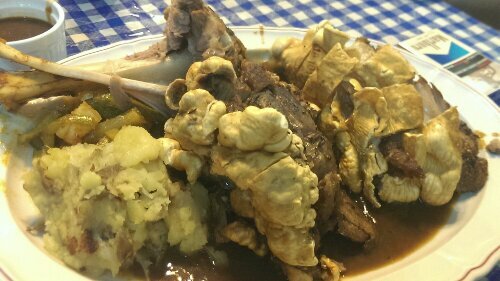 Stew Küche @Bukit Merah Lane (Singapore) | Get Your Grub On! When stopping over on the way back from Sentosa for ‘De Burg‘ burgers we decided to also try out the german stall in the corner to see what their skills were on german rotisserie. Being all hungry we ordered the large ‘Pork Knuckle‘ which was 1.6 kg bone in. When a friend brought it over it looked a bit weird, all crisped up like on the picture. This might have been caused by quick frying the knuckle after roasting it to make it extremely crispy and less chewy to eat. The meat was very nice and tender and the skin was roasted til super crisp and therefore actually wasn’t that greasy. I would have liked it a tad more greasy for once but this was good; so good I even used some of the crackling to pimp my ‘Singhjector‘. What I found best about this dish was the gravy which was meaty, dark rich and savory and fantastically had cumin in it which reminded me of the style you get in Munich, lovely. The sides though were not really anything to be crazy about – the roast/mashed potatoes were okay but there was a weird tangy cucumber veggie dish as well which reminded me more of the stuff you get aside ‘Nasi Biryani‘. Summarized, this was actually quite nice and compared to all the german restaurants, I have been to here and that are offering the same dish, it was also a bargain at around $25 for the huge portion. I loved the meat, I loved the cumin and will definitely come back here once I crave the knuckles again.